Personalized weddings are one of the hottest trends in 2012 - every bride wants her day to reflect her personality and style. WhereBridesGo.com has just the thing to help you express your personal taste throughout your ceremony and reception. 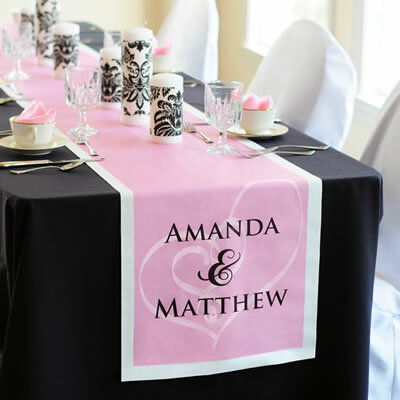 Have you considered personalizing your aisle runner? Personalized aisle runners set the stage and add your own personal flare as you walk down the aisle. Our Embracing Hearts Aisle Runner will capture your guests attention and create a beautiful walk way for your ceremonial debut!! With its interlocking heart design and romantic style - garnished with your names, wedding date and the accent color of your choice - this unique ceremony detail is made exclusively for every couple who chooses it....and at NO additional cost! It's a gorgeous pop of personalized color for every bride and groom and a "must have" for your ceremony. Each one can be embellished in one of today's hottest wedding colors and the crisp white runner provides an ideal canvas for the trendy, DIY bride to get really creative! All Aisle Runners come complete with adhesive strip backing for placement and easy pull cord for extension. We have several designs available. Carry the pesonlized theme over to your reception by accenting your tables with our Embracing Hearts Decorative Table Runners. With its saturated, color block design - accented with your names inside two interlocking hearts - this unique table decoration will easily add a pop of stylish flare to your wedding day decor. From ball room extravagance, DIY or backyard settings, every reception will come together beautifully when you complete your tables with these standout accessories! And because each one is available in a variety of today's hottest wedding colors and personalized free of charge, the crisp white table cloth provides an ideal canvas for the trendy bride to get really creative! For more ideas on personalized items for your wedding, please visit us at WhereBridesGo.com - it's where Brides Go for What Brides Love!! For a limited time, use coupon code VIPBRIDE to take an additional 10% off your order. Shipping is always free on orders over $100 within the Continental United States at WhereBridesGo.com! For more wedding favors and bridesmaid gifts, check out WhereBridesGo.com!